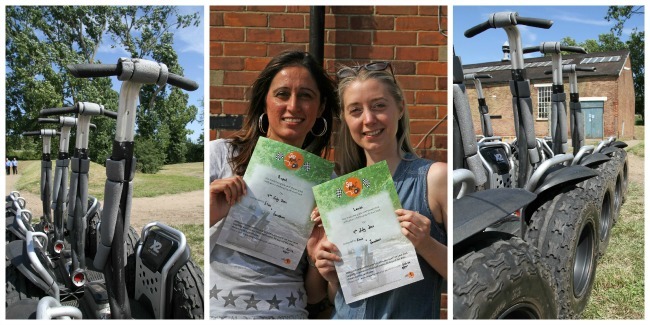 Last month, we sent two of our colleagues along to try out one of our most popular experiences – Segway riding! 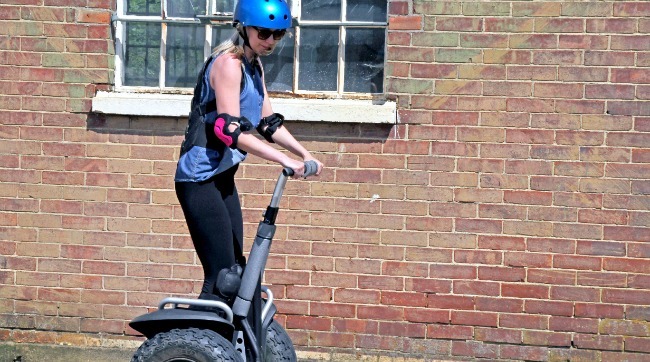 “I have always wondered what Segway riding would be like – it’s such a unique way to travel – so when the opportunity to go came along, I jumped at the chance! We arrived at the venue pretty early, which was good because we got to see the previous session finishing up, giving us a little preview of what was to come. I started to get nervous at this point, it’s hard to understand how these things can stand up on only two wheels! First things first, we got padded out in our safety gear – helmets, elbow pads, knee pads and most importantly, a ninja turtle style back protector! Next up was the safety brief – we learnt all the dos and donts of Segway riding, the main thing being – if you fall off, don’t hang on because you might end up running yourself over! After we had gotten used to the Segways, we headed towards the woodland area. There were curves and hills – but the sight of a hill terrified me so much that I decided to stay on flat ground. After a few laps of the woodland track, it got easier to manoeuvre and I felt quite comfortable riding the Segway. Yes, OK, I got lapped a number of times but the most important thing was, that I didn’t fall off! Have we inspired you to try out the transport of the future?